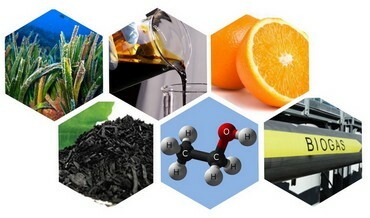 Biomasses are a renewable resource having important expectations in terms of application in the energy field. According to such topic, the activities carried out by the BCT team aim mainly at studying and optimising the thermal and catalytic technologies for converting biomass and industrial waste into energy vectors (hydrogen and/or biofuels). Chemical and physical characterisation (elemental and proximate analysis, pH, density, etc.) of potential raw fuels. Study and development of pyrolysis and gasification processes applied to lignocellulosic waste material (agro-industrial residues) and algae for alternative fuels production (bio-char,bio-oil and biogas). Developing reforming processes (with vapours and/or oxygen) for the sustainable use of hydrocarbons (methane, biogas, ethanol, glycerol, 2-propanol) for the hydrogen-rich syngas production through the ad hoc syntesis of supported metal catalysts. Study and characterisation of solid materials and their testing. Such materials are adsorbent ones for the cleaning of sulphur-based pollutants and/or C3-C15 hydrocarbons (i.e. : zeolites, metal oxides, etc.) coming from gaseous streams. Energy recovery of the digestate produced through anaerobic digestion as an alternative to its traditional use as an amendment for agriculture, through desiccation and pyrogasification even obtained through blending it with lignocellulosic biomasses.